Ever Sunday, babies through 4th grade kids experience their own unique, age-appropriate environments where they learn about the Bible in creative, fun and relevant ways! 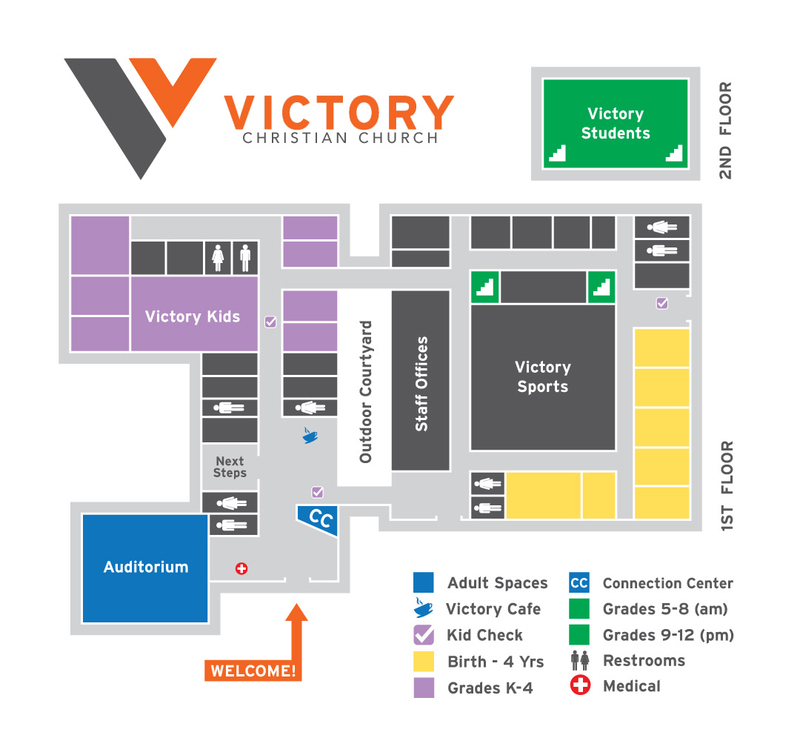 We would love for your family to visit Victory Kids this Sunday! We are passionate about kids learning about Jesus in ways that each of them can understand. From the moment you park and walk through the doors, you will find many eager faces ready to help you get where you need to go! Click here to see a map of our building. Your first stop when you get here is our Check-In Station! One of our volunteers will be ready to help get you checked in and help make sure we serve your kids and your family well. We'll take some time to learn about your child(ren) - ask about allergies, get names, and gather your contact info. Then, you and your child will both get a sticker with a matching code. If for any reason we need to reach you during the gathering, you’ll see your kid’s code in the upper left corner of the screen. This sticker is also what you’ll use to pick-up your child after gathering. To save time, consider filling out our pre-registration form before you come so that your family's information will be added to our database before you get here and so that we can get you to where you need to go, quicker! For more information on how our Check-In system works, click here. At Victory Kids, we believe the Bible is the greatest book ever written! We strive to bring biblical stories to life through activities and conversation designed to keep kids engaged and learning about Jesus. There is nothing more important to us than the safety of your kids! Every aspect of our check-in system is designed to keep them safe. All of our volunteers have also passed a background check. Our team is trained to keep your kids safe! All of our environments, curriculum, small group materials and activities are created and designed with your child's age in mind. At Victory, we are a church of groups. That includes Victory Kids! When families commit to attending the same service each week, kids are placed in a small group of familiar faces where relationships can grow. We design each week with fun in mind, because we know that kids love to have fun! ...And so do we! Kids will participate in fun activities, games, skits, signing and dancing all while learning about Jesus. We know that when kids have fun at church, they are more engaged, and they keep wanting to come back! It's our goal at Victory Kids to create positive answers to both of those questions each and every week. Want to get more involved with what your child is learning? Follow Victory Kids on social media using the links at the bottom of this page. Follow Victory Kids on social media.